The Los Angeles Fashion District is 100 square blocks of shoppers' paradise in Downtown LA. The bulk of the LA Fashion District is roughly between the 10 Freeway to the south and 7th street to the north, and Main Street to the west and San Pedro to the East, with a little overflow in each direction on certain blocks. The Metro Blue Line San Pedro Station is one block south of the southern end of the Fashion District. The primary function of the Fashion District is for designers and garment manufacturers to sell their wares wholesale to boutiques and department stores. Designer showrooms are generally not open to the public. However, many of the manufacturers with storefronts also sell retail to the public. This guide is specifically for retail shoppers. Hours vary for individual shops, but most of the stores in the Fashion District are open from 10 am to 5 pm from Monday through Saturday. About 30% of them are open Sunday as well. Some Santee Alley businesses are open 365 days a year. The busiest shopping day is Saturday, so if you can avoid shopping on Saturday, you'll find a more relaxed atmosphere. Businesses that are Wholesale Only (Solo Mayoreo in Spanish), usually have signs posted so you won't waste your time and theirs trying to shop there. As intimidating as it sounds to find what you're looking for in such a huge area, The 100 blocks of the Fashion District are further segmented into specialty areas so you can better target your shopping. It's also not all dedicated to finished apparel. The area also includes the Fabric or Textile District, the Flower District and the south end of Gallery Row on Spring and Broadway. The Jewelry District and Toy District are also adjacent to the Fashion District. Check the Fashion District Map for exact locations of each. These sub-districts indicate a preponderance of a certain type of store, but it doesn't mean that the only things for sale on that block fit into that category. 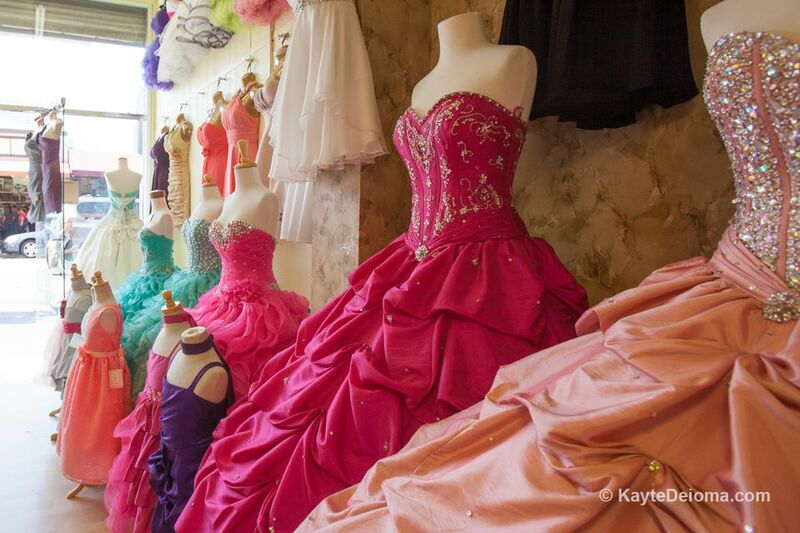 There are almost as many prom dress shops on Maple in the general Women's Wear section, as there are in the "Prom/Special Event" sub-district along Santee and Los Angeles Streets. The sub-districts are also not necessarily contiguous. Most of the women's wear blocks are spread across the middle of the Fashion District, but there are Men's Wear blocks to the south and to the north. If you're shopping for something in particular, it's helpful to look at the official LA Fashion District Map, then drive through the different areas to get an idea of what they're actually selling before you decide where you want to start. You can see from the mannequins on the sidewalk and the shop windows, what type of clothes and accessories are being sold on any given block. If you want to do some advance planning, you can check out the Google Maps street view of the area before you go, but it may not be exactly the same when you get there. What constitutes a bargain depends on who is doing the shopping. In the LA Fashion District, you may find a $4,000 evening gown for $1,200 and consider that a bargain, or a $100 gown for $19.99. You may be looking for the shops with trendy casual apparel all under $8.99. With over 1000 shops from high-end hand work to cheap knock-offs, all those are possible. Santee Alley is the most famous retail section of the LA Fashion District, having received a lot of attention from bargain-hunting media. It is a pedestrian shopping zone with 150 shops between Santee Street and Maple Avenue, from Olympic south to 12th Street. Although it's in the middle of the Women's Wear sub-district, it's known for bargain prices on apparel, shoes and accessories for women, men and kids, toys, perfume, gadgets and more. Santee Alley is open seven days a week, including all holidays. Most shops are open from approximately 10 am to 5 pm every day, although some close on Sunday or Monday. Some vendors open a little earlier or stay open a little longer, but by 6 pm the entire area is closed for the day. New Alley is an extension of Santee Alley that continues south across 12th Street. Follow these tips to make your Fashion District shopping experience more pleasurable. Bring cash. Most places take credit cards but are more likely to give you a deal if you pay in cash. If you love something, but the fit isn't perfect, most shops will happily refer you to a nearby tailor who can alter your purchase while you wait (if it's not too late in the day). Some wholesalers have weird policies to discourage retail shoppers. For example, one evening gown wholesaler with dresses from $19.99 to $99.99 allows retail shoppers to only try on one dress per day. If you're planning on texting pictures of clothes, or yourself in the clothes to a friend to get their vote on something, some shops are really strict about not letting you take photos. Others are more flexible. The manufacturing plants and warehouses are nearby. If a shop doesn't have the size and color you want in stock, they can often get it within an hour or two. Shop well ahead of prom or wedding season to find your size in stock and get the best deals. As prom approaches, the selection of dresses in your size will shrink. Extra smalls in particular end up in short supply at least a month before prom, so shop owners have no incentive to negotiate on prices. On the other hand, if you happen to be whatever size they still have in abundance the week before prom, you could score a good deal because demand is about to plummet. Have a food plan. Dining options right around Santee Alley are scarce, so hot dog and taco stands are pretty much the only options, other than a fresh fruit vendor who may or may not be around. A couple blocks outside that core area, there are more options, but most of them are fast food, so if you're looking for something healthier, plan ahead and know where you're headed. Look up. Most of the retail shops are at street level, but as you're walking along the street, you might miss that some blocks have two stories of shops. When Are Sample Sales in the LA Fashion District? Sample sales take place the last Friday of each month from 9 am to 3 pm, except if there happens to be a Trade Week going on. There may be additional sample sales in December. Street parking in the Fashion District is metered and limited to an hour or two. The meters take coins or credit cards. There are multiple parking garages and lots on just about every block. The rate for the lot is usually on a placard out front and goes down later in the day at some lots. Some are misleading, putting up a sign that says $5 with tiny print that says "after 3 pm" and when you drive into the lot, they want to charge you $10, so pay attention to the small print before entering. Look for the words "all day" to be sure. Use www.bestparking.com or the bestparking app on your phone to scout lot prices in the area and weigh the rate with the distance from where you want to be to find a happy medium. It doesn't include every lot and is not always 100% accurate, but it's close. There are lots starting at $3 or $4 per day if you're willing to walk a few blocks. The LA Fashion District has a cell phone app that also includes information on parking. If you're planning on exploring the 13 floors of showrooms at the California Market Center during a sample sale, it might be worth the $9 to park in their underground garage (only available on Sample Sale days) so when you're out of steam, you don't have far to go.